One quick way to get my attention is to promise me a "turn-based strategy game with card and board game elements." That does check off quite a few of my favourite things. The good news is that German indie developer, Argonwood, looks set to deliver to the promise of the premise. 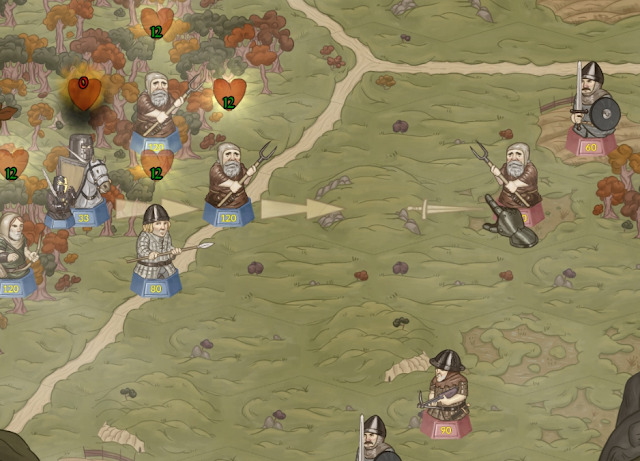 Rather than being an out-and-out military strategy game, Rising Lords also encourages players to consider the prosperity of their people, giving them work to do in the field, building cities for them to live in, and guiding their progress towards knighthood. Manage them poorly, and you'll face a peasant revolt. Manage them well and you'll be able to take on your opponents from a position of strength. The multiplayer mode allows for up to four people to play at once, and each person manages their turns at the same time. That means you'll also need to think about the strategies that your opponents will undertake, and tricking your opponent into guessing wrong what you're doing will be a big part of the game's competitive mode. The teaser trailer that we've got is just enough to whet the appetite. This one has quite a ways to go until release - 2019 - and is currently only set for release on PC. We'll be keeping a close eye on its development, though, and hopefully if it's a success there will be a console version in the works too.